Vancouver, BC – The fastest week in Canadian cycling kicks off this Friday, July 10th, as BC Superweek gets underway with the Tour de Delta’s MK Delta Lands Criterium ­– the first of eight races over nine days. With $120,000 in prize money on the line and some of the top Canadian cyclists and professional American teams registered to participate, the racing figures to be fast-paced and exciting from start to finish. Below is a list of some of the top riders coming to BC Superweek, although if history has taught us anything, it’s to never count out top local riders. Many of them are now on this list as returning pros after catching the eye of team directors at past races. Born in Edmonton, but a resident of North Vancouver, this is Anderson’s seventh season on the professional cycling circuit and third with Optum Pro Cycling p/b Kelly Benefit Strategies. Just over two weeks ago, Anderson finished second at the Canadian National Road Race Championships for the third time in his career. The 27-year-old has no fewer than eight podium appearances in 2015, including first place finishes in Stage 3 of the North Star Grand Prix in Minnesota and in Stage 2 of Troféu Alpendre do Guadiana in Portugal. He made it onto the podium three times at BC Superweek last year, including second place finishes at the Tour de Delta Brenco Criterium, White Spot | Delta Road Race, and the Global Relay Gastown Grand Prix. After podium appearances at BC Superweek last year in the UBC Grand Prix, Global Relay Gastown Grand Prix and Giro di Burnaby, Hanson looks for another solid showing in 2015. The 33-year-old sprinter from San Diego had nine first place finishes and landed on the podium in sixteen races on three continents in 2014. After victories in 2012 and 2013 at the Global Relay Gastown Grand Prix, the former US Pro Criterium champion hopes to win a third title in Gastown and tie the 33-year-old men’s record for most wins, held by the legendary 7-Eleven rider Ron Hayman (1981-83). In 2014, he was anointed the title of “Mr. Tour de White Rock” by the race announcers because of his regular appearances on the podium at those races, but in reality, Knauer has boasted great success at BC Superweek for three years. The 26-year-old had six Top 10 finishes last year alone, including a first place finish in Stages 1 and 2, and the omnium, at the Tour de White Rock. Knauer made five BC Superweek podium appearances in 2013, including first at the Giro di Burnaby. In 2012, the Bamberg, Germany native won Stage 1 and was third in Stage 3 of the Tour de White Rock, which gave him the omnium. Boivin, 26, is coming off an impressive Canadian National Championship last month, where he won his first Canadian Road Race title. He also won Stage 3b and the Mountain Classification at the Tour de Beauce in June. Boivin had his most successful season in 2012, finishing second at Ronde van Drenthe in the Netherlands, third at the Tro-Bro Léon in France, and fourth in the Grand Prix Pino Cerami and Handzame Classic, both in Belgium. The Montreal product won the 2009 Canadian National U23 Road Championship and is a two-time winner of the Tour de Quebec – once as an amateur in 2008 and once after turning pro in 2010. The veteran sprinter from Australia enters BC Superweek this year on a roll, with first place finishes in his last three races. Clarke was the overall winner of both the USA Cycling 2013 and 2012 National Criterium Calendar Individual Titles, and the 2013 USA CRITS Series Individual Champion Title. The 15-year pro garnered an impressive 39 top three finishes in three years (21 in 2013, eight in 2012, and ten in 2011). In 2014, Clarke had podium finishes at the Giro di Burnaby and UBC Grand Prix, along with Top 10 finishes at the Global Relay Gastown Grand Prix, Boston Mayor’s Cup, Boise Twilight Criterium and two races of the Tulsa Tough omnium. A 21-year-old who makes his home in St. Catharines, Ontario, Perry has been racing competitively for the past five years and is the reigning Canadian Road National Criterium Champion. He finished first in the U23 Canadian National Championships Road Race in 2014. Last month, he won the 122.4 kilometre Stage 5 of the Tour de Beauce in Saint-Georges, Quebec. A student at Brock University with designs on getting his Bachelor of Business Administration, Perry had four Top 10 finishes in 2014 – all at races in Europe – including first at the Grand Prix Roger Degrendele, fifth at the Omloop de Braakman, fourth at the Grand Prix Douchy les Mines, and ninth at the Tour of Namur. Kirchmann, a marquee rider in the women’s field at BC Superweek, was third at the inaugural edition of La Course by Le Tour de France last July. The 25-year-old had six Top 5 finishes at BC Superweek in 2014 with wins in the Tour de Delta Brenco Criterium, White Spot | Delta Road Race and Global Relay Gastown Grand Prix. The Winnipegger was second in the Road Race and third in Individual Time Trial at last month’s Canadian National Championships. She was also first in Stage 2 at the Joe Martin Stage Race in Fayetteville, Arkansas in April along with Stages 2 and 3 of May’s Tour of California. Kirchmann is a four-time Canadian Criterium National Champion (2014, 2013, 2011, 2010) and also claimed silver at the 2012 Pan American Championships road race. Olds is one of the highest ranked road cyclists in the world. The Groton, Massachusetts native finished sixth at the 2014 UCI World Championships in Ponferrada, Spain. She won the overall general classification at the Giro Toscana in Italy and two stages, as well as one-day victories in the Cornaredo Road Race in Italy and the Winston-Salem Cycling Classic in the US. In 2012, the 34-year-old won the UCI Road World Cup Event in China, a stage of the women’s Giro d’ Italia, and finished seventh in the women’s road race at the Summer Olympics in London. She was the Pan-American Road Race Champion in 2010 and two-time US National Criterium Champion, in 2010 and 2011. She is also a two-time US National Scratch Race Champion on the track. Anderson finished second at this past January’s USA Cycling Cyclo-cross National Championships. The Dartmouth grad had two Top 10 finishes at BC Superweek in 2014, with a sixth place finish at the UBC Grand Prix and a seventh place finish at the White Spot | Delta Road Race. In addition to her success at BC Superweek, the 27-year-old had no less than six podium appearances last year, including two first place finishes. Anderson was on the podium at BC Superweek four times in 2013 with third place finishes in Stages 1 and 2 of the Tour de Delta and the UBC Grand Prix, along with a second place finish in Stage 3 of the Tour de Delta. Jackson is coming off a win in the women’s criterium at the Canadian Road National Championships just over a week ago. A multisport athlete, Jackson competed in the 2014 ITU World Triathlon Age Group Sprint Championship and finished second. She helped the Trinity Western University women’s cross country team to a second straight Canada West championship and a program best CIS silver medal. In March 2014, Jackson also raced in the world university cross country championships in Uganda, helping Canada win a bronze medal in the team competition. A year ago, the Abbotsford resident won Stage 1 of the Tour de White Rock along with the overall omnium, and finished second at the Tour de Delta Brenco Criterium. Farina is the 2011 US National Road Race Champion and was a 2012 Olympic long team member. The 37-year-old is also one of the original founders of the Women’s Cycling Association and has been a catalyst for the organization’s growth as a global movement for women’s equality in cycling. Other career highlights for the Nashville resident include winning the Joe Martin Stage Race in 2008, participating in the 2011 Pan Am Games, winning the 2012 Tour de Nez and the 2012 Tulsa Tough Brady Criterium. 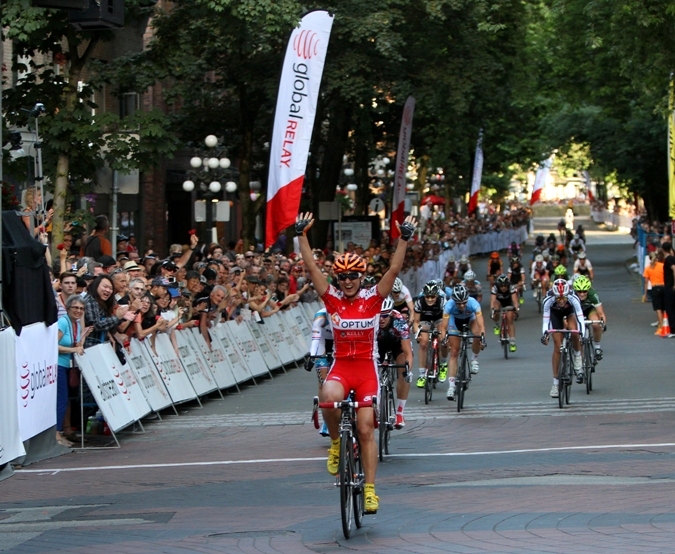 Farina gained four podium appearances at BC Superweek in 2013, among them was a win at the Tour de Delta Brenco Criterium. Kiesanowski is a three-time Olympian (2004, 2008, 2012), three-time Commonwealth Games representative, and eight time National Champion for New Zealand. She’s also finished Top 10 in her last five races heading into BC Superweek. The 36-year-old won the UBC Grand Prix in 2014 and finished first in the Schlitz Park Criterium in Milwaukee, Wisconsin. She won the omnium at the 2013 Air Force Classic in Arlington, Virginia and the Sprinter Series Competition as part of the 2013 Women’s Prestige Cycling Series. Kiesanowski comes by her cycling ability honestly, as her first cousin, twice removed, was the first New Zealander to race in the Tour de France. BC Superweek is Canada’s biggest professional road cycling series and features more than $120,000 in prize money available during eight races over nine days. BC Superweek runs from July 10 – 18, and is made up of the Tour de Delta (July 10, 11, 12), UBC Grand Prix p/b Mahony & Sons (July 14), Global Relay Gastown Grand Prix (July 15), Giro di Burnaby p/b Appia Development (July 16) and Beverley by Cressey presents Tour de White Rock (July 17, 18).